So strong, so strong… No, don’t thank me for putting you this international HIT in the head for the day, it’s a gift! 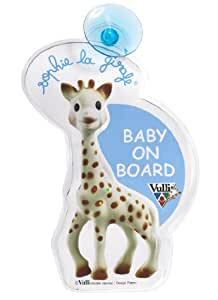 I am of course referring to… the Sophie the giraffe of Vulli Nightlight! As you know,OWL is in love with the famous giraffe rubber for a long time now and it’s a story that lasts, that duuuureee. The approach of his birthday, I got lucky that we propose to test new Vulli, namely the pilot light. How to tell you it was perfect timing! But the most beautiful in all of this, it’s the gift I ordered initially for OWL arrived so late! I had therefore NO gift for my baby to offer him for his first birthday, imagine my dismay! (By the way, I very strongly recommend the bassinet-private site, huh, their customer service is… non-existent, in short, it’s not the subject!) Back to Vulli and our giraffes. Vulli has thus saved my life, finally, the birthday, the first birthday of my little owl (which is the same). I am so eternally grateful! So I packed up the pretty pilot, and with Daddy, we waited Monday 24, the day J, for her offer. And there… I already told you about the amooouuuuur OWL dedicated to Sophie? Well this is! Nothing that to see a smile blossom on her face at the sight of the pilot, I just couldn’t. He immediately shaken, manipulated, tasted… to realize that “Oh well she’s not like the others!” And not little owl, she is not rubber that one! PIF paf pouf Daddy put the batteries (there is that it’s a Daddy thing, the batteries?) and it’s MY turn to have fun hahaha! I press all the buttons, I turn the dial, OF COURSE taking care to read the operating instructions provided (of course, of course…)! 3 melodies are too Charlie, the lights also, we can choose if we want light, AS music or both at the same time, in short, am I conquered! As for OWL… at the risk of repeating myself, seen his love story with Sophie, he’s just hypnotized by the zany see, kind is the ball of his life. Not serious, because, the nightlight for kids is resistant (better when we know the specimen hibouesque isn’t it? ): not a scratch on the meter; and two, we can also put it on a shelf or a night table! So now, Sophie is in height and OWL is the show every night when he goes to bed. He falls asleep in 2 seconds and guess what? It works even for a NAP!That’s why I vote FOR a million times! There has even been a few night Awakenings and there again, the pilot has proved effective since it can trigger (if one chooses to set it for) by detecting the baby’s crying.I tried putting myself in side and speaking, it really takes a good big Yes Yes for it get under way, because personally, I was afraid that it goes off at the slightest sneeze or other… This is not the case, she’s great I tell you, great! The only nuance I would bring, it’s that it enlightens not bad and that even at the lowest volume is “consistent” (Finally, I reassure you, not what become deaf either huh!) but that’s REALLY nitpicking! And to prove how much she rocks everything, Vulli and you’re offered to win a copy of the said night light! Isn’t this wonderful? To do this, leave me a comment below to tell me who you would like to offer this gift AND you’re going to take a ride on My facebook page. Only people who are fans of the page and who have commented on this post will participate in the draw which will take place on Monday, December 8.You have until Sunday 7 December at midnight to participate. The metropolitan France contest. Well what do you expect? OYEZ OYEZ! Nozzle head I am (sorry, but I have more than one neuron, as you know) forgot to tell you that he also had to go like our friend Sophie the giraffe on Facebook !Attention! From that day at 12 h 48, you have to like both pages (mine and Sophie) for your participation is taken into account!